First off, packing for any trip is all about organisation, and the importance of this is magnified inordinately when young humans are involved. It can take years of hiking to figure out a system that works for you (and your budget) but here are some universal tips that work for us. Colour coded dry bags, so you can easily find what you need in a hurry; waterproofs in an orange bag, clothes in a yellow bag, food in a red bag, for example. Things you might need urgently should be store at the top of your bag even though you will be hoping to not need them at all; first aid kit, waterproofs, etc. Try to pack everything inside your bag and not attach things to the outside, we had to break this rule on our Sweden trip because we simply ran out of room thanks to only having a 65 litre pack to carry three people's gear, but it makes for uncomfortable hiking and if it rains it's unlikely your rucksack's rainsack will cover everything. We usually remove the tent poles from our tent's stuff sack and pack them separately so we can squish our tent into the sleeping bag section of our rucksack. Lastly, you do not need to take spare clothes, but we always, always, pack long merino base layers so we have something dry and warm to change into at the end of a rainy day's hiking; sitting, shivering in either wet clothes or naked in a tent is a miserable experience and one which need not be endured. The North Face rucksack is Andrew's old pack, it has been to a lot of places and is now ready for retirement. 65 Litres wasn't really big enough for all our gear but we managed to squeeze in camping gear, food, water, and clothing for the three of us. This pack doesn't have anywhere near enough outside pockets, making it difficult to organise and access things that you would like close to hand. The Osprey Poco AG Plus is what we use to carry Benji around in. We have had it since he was 5 months old and have carried him many, many miles locally and into the mountains of the Lake District, Norway and Sweden. It can be uncomfortable at times, but it is very well designed and makes carrying a heavy, moving child about as easy as you can reasonably expect. The Plus model has a good amount of storage for Benji's stuff (nappies etc) but with Benji weighing 12.5 kgs alone and the pack itself weighing 3.48kg it didn't take much extra gear and some water before the pack became very heavy. Benji is 2 years old and weighs 12.5kgs. He generally makes for a great hiking companion, is tirelessly inquisitive, very adaptable and low maintenance. He does however have a low tolerance for wearing sun hats in hot weather, has a large appetite, and is prone to occasional meltdowns. Taking Benji to wild places has been the most rewarding thing we've ever done; if you have your own baby or toddler, we highly recommend it. We have had this tent since Benji was born, we saved up hard and bought it especially so the three of us could go wild camping together. We've used it a few times but never really put it to the test. It was absolutely perfect for this trip however, being very light for its size (2.4kgs) and has a huge vestibule for storing gear and cooking when the weather is poor. 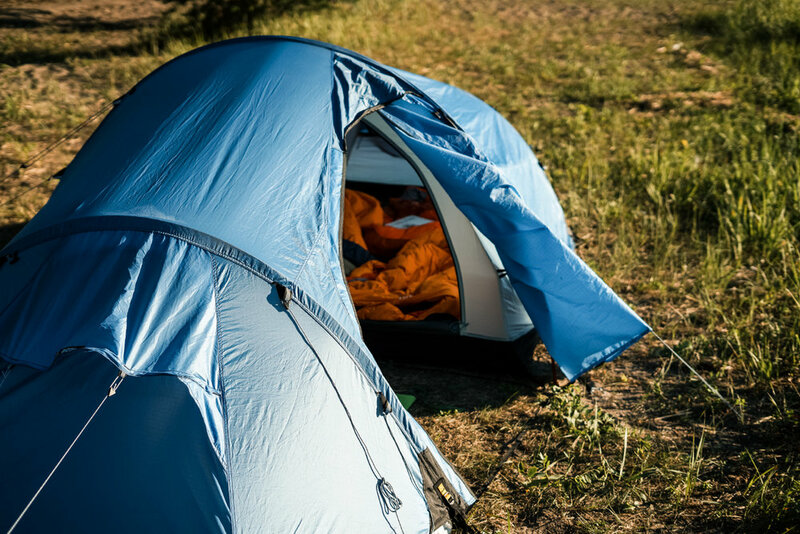 It's a true hiking tent so low weight has been favoured over liveability, but despite it being a little cramped inside it's comfortable enough for two adults plus a little one. There's no getting around the fact that Fjällräven tents are expensive, but there are a lot of details that make it clear that the tent has been designed and tested by people who actually hike and camp. The build quality is brilliant, it feels more dependable and rugged than its light weight would suggest. Rab Neutrino Endurance 200 bags - so tiny, yet so warm! 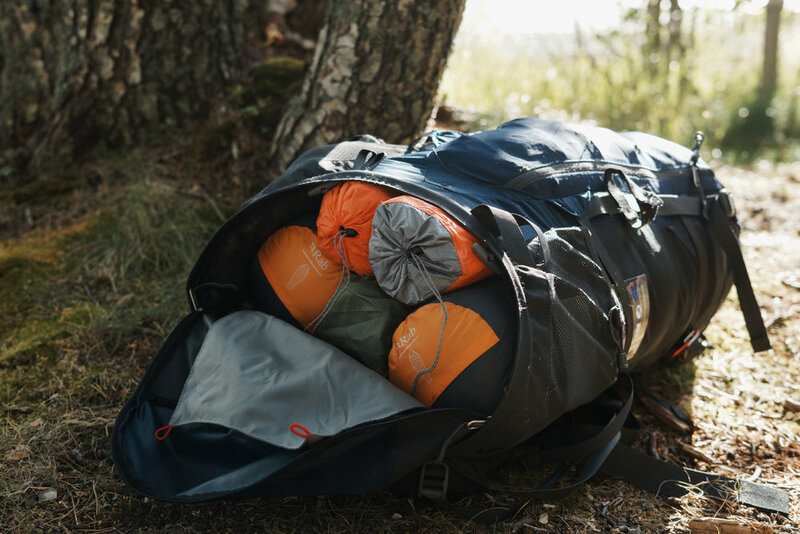 We are fortunate enough to have worked with Rab several times so were super stoked to be able to try out their Neutrino Endurance 200 down sleeping bags in Sweden. These were the real difference maker for us; the small pack size of the bags when compressed made it possible to fit everything else in that we needed. Two of these fit in the space that we could normally fit one sleeping bag! We opted for the Neutrinos because we knew they were small and light, but we weren't expecting them to be so warm too - although we chose them for our summer hike, we wouldn't hesitate to use these into the autumn and maybe beyond (it's also worth noting that the bags are filled, stitched and finished in Derbyshire with ethically sourced (R.D.S certified) European down). The Deuter Little Starlight was Benji's sleeping bag. It's pretty much a miniature version of a normal sleeping bag and Benji absolutely loves sleeping in it. Its pack size is annoyingly large however, given it's about half the size of an adult sleeping bag and this was one of the bulkiest items we had to take. 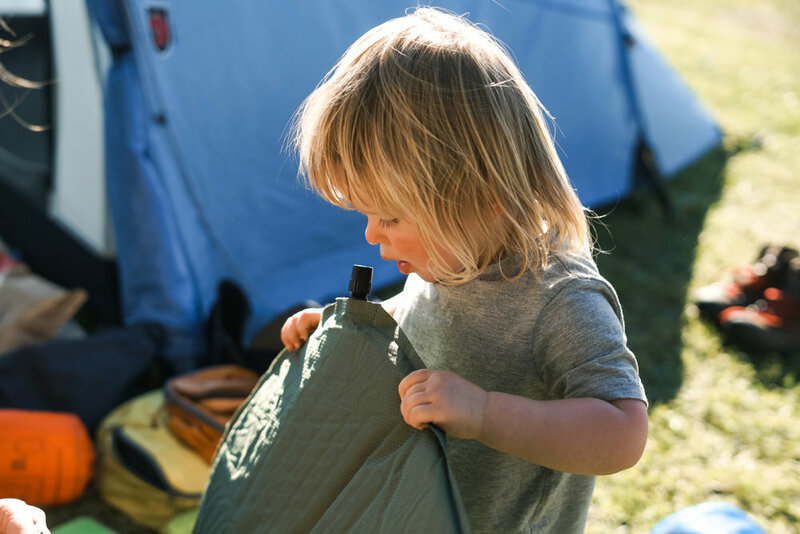 We got rid of the stuff sack it came with and compressed it into a dry bag which helped a little, but we are on the lookout for a lighter, smaller child's sleeping bag - recommendations welcome! Sleeping bags and mats easy to access from the bottom opening of Andrew's bag. Now, sleeping mats are not particularly inspiring but choosing the right one can definitely make a huge difference to the enjoyment of a multi- day hike. We actually upgraded our mats especially for this trip, our old Exped ones took up too much space in our tent as they were rectangular rather than tapered. The Sea to Summit Ultralight Insulated mats pack down really small and did a good job of soaking up the bumps on the uneven pine root ridden, Swedish ground. We slept really well on them, despite the perpetual light. The 3/4 length Multimat is for Benji and it fits perfectly between our full sized mats in the tent. Clothing: We won't go into the specifics of our own clothing here, we packed lightly, each taking only waterproofs, an insulation layer, long base layers for a dry change and one luxury, Tevas so we could give our feet an airing at the end of each day. Clothing for a young toddler however is very important; being carried most of time means they are unable to generate their own body heat through movement, so they get a lot colder than you do. It’s also important that they have good quality waterproofs and breathable, quick drying clothing where possible - as adults, we know that the clothing you wear when in the great outdoors can have a huge impact on your comfort levels, and the principles you apply to your own clothing should be the same for your kids if you want them to have a nice time. We nearly always opt for Patagonia clothing for Benji, not because it looks cool (although it does), but because their toddler and baby clothes are made of the same materials and to the same standard as their adult clothes. Patagonia also do about as much as anyone can to reduce their environmental impact and promote sustainable practices which is huge for us, especially with kids clothing. Benji had a Torrentshell waterproof jacket, a synchilla fleece and a full set of thermal base layers for sleeping in meaning it was easy to regulate his temperature, keeping him comfortable and happy. Good clothing is expensive, no doubt, but we've found that it holds its value, meaning we can sell Benji's gear as he grows out of it to raise funds for new items. We packed our clothes into Millican packing cubes which fit perfectly into our rucksack. Cooking equipment: Snow Peak Trek 900 titanium cook set, MSR micro rocket stove, MA titanium mugs, MA wooden spoons, MA Summit chopping board, knife. We kept our cooking equipment to a minimum as we were mostly eating dehydrated meals, meaning we only needed to be able to boil water on our stove. We always take one of our little chopping boards, even if only to provide a stable platform for the stove or for slicing up dried ingredients and snacks, and we always have a good sharp, sturdy knife. Food & Water: Trail porridge, Firepot outdoor food, Swedish Polarbröd, squeezy cheese, moose sausage, trail mix dried fruit, moose wild chips, chocolate, toddler snacks. Food and water were actually a real challenge. We struggled to fit enough food into our packs for the duration of the hike, mostly because Benji requires a lot of fuel to keep him happy. For dinner we took Firepot dehydrated pouches which were really delicious; the meals are all made by hand in Dorset before being dehydrated and we were grateful for hot hearty meals at the end of each day. We took 4 of these which we thought would be enough, we were wrong however and we'd definitely take more if we were doing the same trip again. Lunches were Swedish Polarbröd with cheese squeezed from a tube and dried moose sausage. We absolutely love this as a snack on the trail but it didn't really provide the sustenance we needed at lunchtime. Breakfasts were of homemade trail porridge which worked really well; porridge oats, dried milk, a little salt and sugar and some dried fruit. We premixed all the ingredients in a ziplock bag and simply added hot water. We talked a lot about the water situation in our previous logbook post, but we would recommend always doing your research, talking to locals about the locations of reliable water sources and always take as much with you as you can. 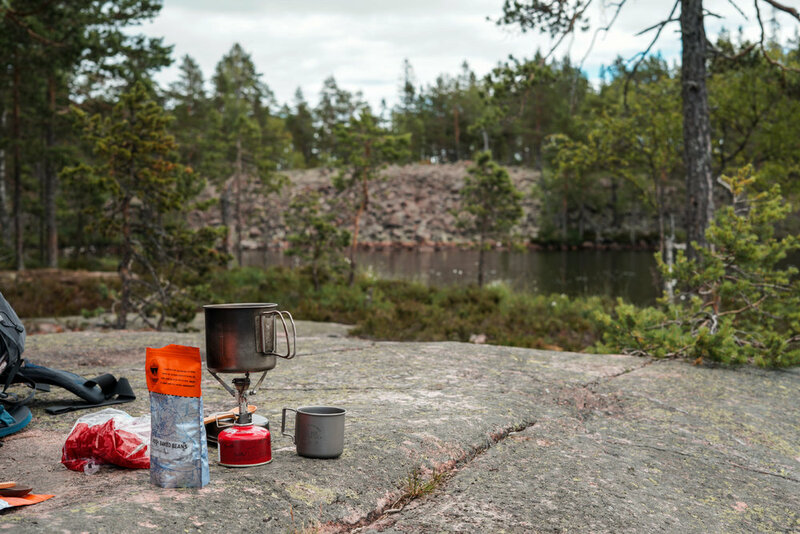 We used a Sawyer squeeze filter to purify our water on the trail; even though the majority of the water in the wilds of Sweden is drinkable straight from the source, getting sick on a trip is not something we want to take chances on. The filter is really tiny and is well deserving of a place in your pack. There's a lot of little bits and pieces that have become essential to us over the years, but we always try to keep gadgets and accessories to a minimum in order to keep things as simple as possible. A basic first aid kit is a must, but make sure you know what's in it and how to use everything properly. We always add a few extra items too based on the kinds of activities we're going to be doing and tools we might be using; a large wound dressing for example, as we often pack a sharp knife or axe. A map and compass are essential too, plus the knowledge of how to use them and some prior research of your route along with potential alternatives should plans change; we were very glad we had done this when we needed to change our route to search for water. We also always have a sharp, sturdy knife and several means of lighting a fire or stove. We took a few extra bits and pieces for Benji, a few small books for bedtime stories, and some field guides which he loves looking through and are also useful to us. We also had to take nappies, these were really bulky and heavy but essential and they obviously have to be carried out once they've been used. In case you're wondering, we use biodegradable nappies and we packed them out in biodegradable bags attached to the outside of our packs. Wow, that turned out to be a lot longer than I planned! Many of you will already know all of this, some may disagree with some of our equipment choices and priorities; that's ok, ultimately it's up to the individual to figure out what works for them and only experience and your personal tolerance for discomfort can teach you this. Hopefully there is some useful information here, especially for those perhaps embarking on an adventure with a toddler for the first time, which we know can be daunting and stressful. We are very happy to answer any questions and also welcome suggestions and feedback, please comment below, e-mail or contact us via Instagram and we'll be happy to hear from you. We'd like to thank Rab and Outdoor Food who very kindly gifted us gear for this trip and to Millican and Keen for their ongoing support!